I was in the Bahama Islands in the late 1960’s. I had just awakened my mania for Scuba and decided that Going Diving was I wanted to do with my life. I was glowing with the excitement of self-discovery when I was confronted with the shocking news that two local divers had died trying to break the World Depth Record for Scuba Diving on Air. I seem to remember they were diving out of Small Hope Bay on Andros Island. The team of three had successfully completed previous practice dives to record depths and were ready for the officially sanctioned Record Dive to make them the World Record holders. Just hearing of the attempt got me thinking weird thoughts. I had just been studying partial pressures of gasses, and learned that their medical effect changed as the partial pressures increased. Nitrogen became narcotic and produced “Rapture of the Deep” – Nitrogen Narcosis. Oxygen at a high enough partial pressure became toxic and could produce out-of-control muscular spasms. The gases in air become poisonous with increasing depth. It seemed to me that what these divers were actually doing was equivalent to seeing how much Arsenic they could take before they would die. Pretty stupid, I thought, what is the point? And more than that, what organisation could possibly sanction such a record. Would it qualify for the Guinness Book of Records? But these divers claimed they had developed special techniques that prevented them from getting poisoned, something to do with ice packs and meditation, possibly? I did not pay much attention as I had already made my mind up that the whole thing was crazy. I discovered later that the three started their descent, but one became distressed and abandoned the dive at about 300 feet. He managed to regain the surface. The other two continued to descend – eventually disappearing off the echo-sounding chart never to be seen again. I don’t think that record-breaking dives are sanctioned anymore for scuba diving breathing air, at least I hope not. But breath-holding records in a multitude of categories are still popular – and still occasionally fatal. It all seems a bit pointless to me. The joy I get being underwater is from the marine life that I am able to swim with, the sublimely beautiful marine landscapes, the poignancy of visiting a long sunken ship or aircraft wreck, and the “back to the womb” sensation of weightlessness. I like the fact that diving is intellectual as well as physical. I certainly believe that with developed skills, and the right equipment and knowledge, dives can be safe even if deeper than the standard 40m. I am quite happy at 60m, and have been deeper – but eventually recognised a depth that takes me out of my comfort zone, and have no intention of ever going deeper than that. I rarely use only air for these exploits. I may use air for the deep part of the dive, but then switch to Nitrox or even pure Oxygen for decompression. Fundamentally I love life and diving, and have no intention of killing myself. Although I admit the thought of another two years of Julia Gillard is truly depressing. Anyway, I am proud to tell you that I am now claiming the World Depth Record For Scuba Planking on the Turret Gun of a World War Two Aircraft Wreck. I have just spent the month of June in Milne Bay PNG aboard Captain Craig de Wit’s live-aboard dive boat the magnificent MV Golden Dawn along with renowned photographers Tony Wu and Julian Cohen and some other great divers. Check out www.tonywublog.com for details and see some of the great photos that Tony took during the cruise. He’s a smart chap, Tony. Craig provides diving for Grown Ups, but made an exception and allowed me aboard. No doubt I have been diving too deep for too long, but I do know a few fishes and seem to be the only diver who usually makes it back to the boat and does not need a pick up. Some of the team used re-breathers, but I stuck with Nitrox, of various concentrations depending on the dive profile. By the way, although I use Nitrox, I dive as if I am breathing air. It is because I think it is safer – and perhaps the fact that my two wonderful 18 (?) year old Suunto Solution computers have no Nitrox mode. I swap them between dives so I get longer bottom times. OK, I just wrote that to see if you are still with me. 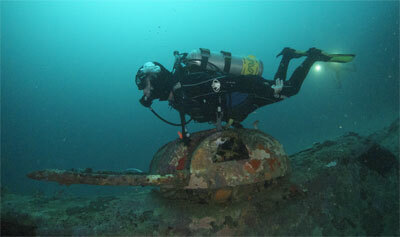 For the B17 Bomber “Blackjack” dive to maximum depth of 46m I used 27% Nitrox with decompression on 32% Nitrox. The dive was carefully planned. Go down, swim around, and come back up again, especially the last part. But I jest. We had a surface buoy marking a descent line down the reef wall off Boga Boga village with an emergency gas supply at 20m. A slow steady descent down this line leads us to the aircraft. With no current running it was easy to make a single pass along the fuselage, shooting photos at the nose and cockpit area and gradually working towards the tail where the broken tip of the starboard tail plane conveniently points back to the line. Bottom time was no more than 15 minutes, or half a tank of gas which ever came first, and decompression stops took place, following the line at first, along the coral wall. Moving slowly with right shoulders along the wall, divers could swim into a coral lagoon, sheltered from the waves, for an easy pick up. Since Golden Dawn was moored well away in a sheltered spot, even I had to get this pickup. During the dive I was to ‘Plank” on top of the turret gun and Craig was to take the photo which has to be posted on the web. Planking is the latest craze for deranged people trying to get attention. I am perfectly qualified. You stretch out flat, like a plank, on some incongruous object. Planking at depth is of course much safer than planking at height above water from where several have fallen to their demise. Nevertheless tension was high as I glided and soared into position above the gun. Someone thought they saw a dolphin! As I settled into planking pose Craig swooped in for the photo. Looking at it I see my technique could have been improved somewhat by straightening my legs and pointing my fins a bit more, but my 42 years of training took over and I adopted the perfect diver’s relaxed power position instinctively ready to zoom away from any marauding predator. Actually my knees were a bit stiff ….. and I learned that perhaps I should not be so demanding on my underwater model. I once took a bunch of Eileen Ford New York models diving and studied their technique very carefully on every dive for quite a long time over and over until I ran out of air. Somehow I imagined that I would look as elegant, but it seems I just look like a silly old git in a black wet suit. But it is probably the lighting. For some reason, I never had wet suits when the models were around. But there it is, my own world record. I cunningly made it at 41m depth to discourage others from diving deeper. That would be very foolish of course. Especially if I found out. Later I’m going to tell you more about the Golden Dawn adventure – about Julian’s underwater crocodile encounter, and the 0900 dive to a wrecked Beaufighter aircraft at 61m that was so dark it turned into a night dive, and the four Wobbegongs under Samarai Wharf trying to feed on the zillions of baitfish, and the Dog House at Diving Dog Passage, and the night of the Sea Jellies, and the most beautiful lime green Rhinopias, and my new fish … and rapture of the deep. Thank you for posting your recollections of the diving incident involving Archie & Ann. I’ve never scuba dived in my life. I never will because of Ann’s accident. My life was forever marked by Ann’s death. Ann lived with our family in North Vancouver through her teens and early 20’s. The reasons she came relates to a personal situation that i won’t divulge, but it seared us to be family. My parents welcomed her into our home, cared for her as their own child through those years & I considered her my sister. We loved her, cheered her successes in life & school & missed her terribly when her new found love of diving took her away from North Vancouver to the Bahamas. I was 15 when the accident happened. I wore her outfits that she’d left behind for the rest of my teen years as I grieved her loss so deeply. I appreciate your remembrance of her in this posting. Thanks for what you shared. I was diving with Archie Forfar most of ’71. One day he told me that Ann wanted to do a deep dive to attempt to break the record. Since I had recently been discharged from the Marine Corps and was trying to figure out what to do with my life, I thought it would be interesting to join them. We dived progressively deeper every day to try to acclimatize to the oxygen toxicity. One day passing through 336′ I got tunnel vision and passed out. I remember seeing my body between Archie and Anne as I seemed to float up to the surface peacefully. Then I noticed Ann forcing air into my lungs by playing with my mouthpiece. Somehow I thought she would hurt my body so I decided to tell her to stop and immediately returned to my body. Ann was holding my left arm and Archie my right arm. We were slowly going up. In a few seconds I seemed to be back in control of my body, and gave them the thumbs up. I was willing to continue with the dive, when Archie seemed adamant that we were all going up. When we eventually go back on the boat, Ann told me that I had stopped breathing, and that why she was pressing on my regulator to get me to breathe. That evening the news was talking about a late storm that was coming, and Archie thought that they may stop diving for a few days till the weather cleared. I had never experienced tunnel vision, and wondered if I had died for a few seconds. I decided to take a break and go to Europe for a week or so to deal with some insurance issues I had, due to a car accident the previous winter. The trip to Europe took longer than anticipated and I didn’t return for about a month. I landed early December and was at JFK getting ready to board a flight to Nassau, when I decided to call the lodge and let them know I was coming back. Somebody there told me that Archie and Ann had died a few days before in a deep dive. I cancelled my flight and stayed in New York, wondering if I would have talked them out of it, of if I cold have helped them, had I stayed. As far as I know, my diving gear is still there somewhere, and I hope Archie and Ann had had stashed a couple of triples in some blue hole, and are now living in peace in another beach somewhere. I gave up diving and went to work on Wall Street. Thanks for those valuable insights and for setting the “record” straight! (and apologies for the double “t”, guess I’ve been too deep for too long …). I agree that there are great differenced between individual divers with regard to tolerance of deep diving on air. One of the most amazing being Dr Eugenie Clark who seems completely impervious to narcosis. We have worked together on more than 20 expeditions over the past 25 years – and I am joining her again (she will be 90 years old in May) in Indonesia in April. She used to start every trip with a dip to 60m and was immediately rejuvenated. Not saying that is for everyone, but sure worked for her, and maybe this time too….! A quick reply on the subject of deep diving on air. Many of us that worked deep on air in the 1970s and 1980s did so since there was no option in remote places for mixed gas. So we either did the job on air or had to pass on the project. A lot us had no real issues working very deep on air since our tolerances for narcosis and oxygen toxicity were extremely high. And we were extremely experienced and acclimated to such exposures. However, anyone who has read my stuff over the years will also note that I have been a strident and outspoken advocate that 99% of divers have no business much below depths of about 200 feet or so on air. Most people just don’t have the discipline or experience to work deep. Later through TDI, I incorporated training protocols for mixed gas and other technical diving methodology that were widely adopted by the industry. Yes, I did a lot of very deep diving over the years and set the world record twice (maximum depth 490 fsw) but I didn’t do my dives in pursuit of a “record”. The dives were part of my work and incidentally happened to be records. I never made much of a big deal about it except to note that some divers were capable of working deep and there were lessons to be learned from that. But I always counseled divers not to attempt what we were doing as it was so far beyond their risk management and abilities. That’s still my opinion. I’ve objectively written on the subject of deep diving for nearly forty years and, hopefully, my perspective has served to educate people on the risks and how to avoid them. I realized in the early 1990s that there was no resource for the average diver to read about very technical subjects of physiology, breathing gas issues, narcosis, oxygen toxicity, decompression, alternate gases to accelerate deco, emergency protocols for remote site accident management, recompression procedures, equipment, etc. That’s when a publisher asked me to write the “Deep Diving” book and it went on to sell over 100,000 copies in seven languages. But I have always been about telling the straight truth without any varnish. Some people can work deep on air. But the overwhelming majority cannot and should not attempt such dives. In today’s world, I don’t think deep diving on mixed gas with open circuit scuba makes sense either. A modern closed circuit rebreather is a far better choice of equipment. Finally, Bob I’m dismayed to hear of the idiotic regulations you are having to deal with in Australia. I suggest you start a new record competition: spearing the highest number of numb-nuts government officials within a two hour hunting period. Good luck and remember to “eat your catch”. Thanks for all the interesting comments, and John you may be right, but at least I have not wasted my life playing golf or listening to pop music (for example). On re-reading the story I realised that some may interpret my comments on Deep Air Records as a desire to control what other people do with their lives. I have absolutely no intention of promoting anything of the kind – this was just a personal perspective. I know Brett was involved in Deep Air records (a long time ago) and as far as I am concerned that is entirely his business. 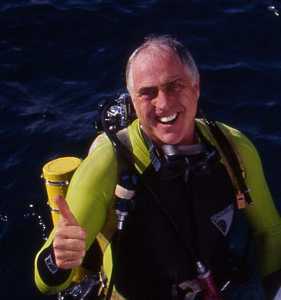 Brett has made a great contribution to adventure diving over many years. I am however interested in, and would value, his current opinion about deep air diving – how about it Brett? Unfortunately in Queensland Australia anyone who shoots underwater photographs and sells the odd picture is classified as a “Commercial Diver” and subject to regulation. This year one more regulation was added to the list and we now have to write a dive plan before every dive, no matter how trivial the dive. Since marine animal behaviour does not conform to written dive plans this makes life a bit difficult – say for example if you planned a maximum depth of 20m and a great hammerhead cruised by at 30m. Difficult that is if you took any of this nonsense seriously. One feels that the sad mediocrities that sponsor and enforce such regulations should be put out of their jealous misery. As usual their attempts to promote safety hide a desire to control and rule. It is a bit pathetic really. Now I’m going to have to go out and do something really dangerous …. I simply provided some details about the accident from direct quotes of the only two eye witnesses when I interviewed them for my book “Deep Diving”. Since you say you were there that day, I’m sure you had the chance to hear it directly from them at the time. I knew George Benjamin quite well but I’m not sure what you were referring to him about in the context of Archie and Ann’s accident. He wasn’t there and had nothing to do with it. You mention that there was “talk” about someone trying for a body recovery using “mixed gas”. But then you say you mean nitrox. Actually neither gas was available then at Small Hope Bay resort. And the dive could not have been done on nitrox since the PO2 would have been off the scale and toxic. Sheck Exley and Lockwood were eyewitnesses and told me no attempt was considered to go back for the bodies as it would have been needlessly risky as the only breathing gas available was air. Finally, Archie and Ann were not going to certify their depth attained by bringing back sea shells. They had marker clips to fasten to the descent line that would have locked in the maximum depth. going back out and diving down to get them, which led to others sitting him down and calming him down. Something else floating around that day was that a mixed gas (as we called nitrox back then) navy diver was poised to do a dive down to them even if it was body recovery, but at the last second was denied authority, believe that this within a half hour of the realization things came apart. My assessment is they did too many things that they didn’t practice before, they task loaded themselves. St. Thomas has 8mm film of prior A/A deep dives, I think Bob may have gone to 315′ with them. In 40 years this is the first time I’ve found anyone interested in what I have to say from our experiences that week. I was at the resort that week! and recordation team would be coming in from Florida. NAUI #4493 instructor / trainer. of Blue hole diving isn’t even known by some at his base of operations Small Hope Bay Dive Lodge. Bob brought up the subject of deep diving records and I thought readers might appreciate an insider look at the tragic dive in the Bahamas that killed the two divers he mentions. This is an excerpt from my book “Deep Diving: An Advanced Guide to Physiology, Procedures & Systems”. This is excerpted from the first chapter on “History” that I intended as a warning to folks who might consider going off and trying dives beyond their capabilities and get killed. In a twist of ultimate irony, Sheck Exley (the safety diver) was later killed in April of 1994 on an attempt for the new cave diving deep diving record in a Mexican cave system. One of the last serious assaults to the Watson/Gruener record was planned in 1971 by the well experienced team of Archie Forfar, Anne Gunderson and Jim Lockwood. Sheck Exley, then 22 years old, was brought in as a support diver. Lockwood set up a regimen of progressively deeper dives for training purposes near the Andros drop-off walls. Although, the youngest member of the dive team at 21 (Forfar was 38 and Gunderson was 23), Lockwood had the most deep diving experience with numerous dives to 400 fsw and deeper. Lockwood was visiting Tom Mount in pursuit of exploring the virgin “Blue Holes” in that area of the Bahamas when he was introduced to Archie and Ann. They had been making dives in the 380-400 fsw range and a discussion was initiated into the possibility of breaking the Watson/Gruener record. It was decided that they would work together and attempt 480 fsw. During the work-up dives, they made 40 dives below 400 fsw including 25 approaching 450 fsw (as measured by SCUBAPRO’s helium depth gauge). They experienced no significant difficulties of impairment during the practice dives and on December 11, l971 considered themselves ready for the official record attempt. ”We had an engine block attached as the deadweight on the end of the 480 ft. cable but we had never unspooled the cable prior to the dive. When we did at the dive site we found it had a tendency to bend and sort of ‘hockle’ and wouldn’t hang straight and true. The dive plan had to be changed.” Forfar and Gunderson elected to abandon the fall-away weight system and make the drop with empty BC’s. Lockwood stayed with the original system and would descend with his BC inflated. Exley, in his role as safety diver hovering at 300 feet, became witness to the ultimate deep diving nightmare. Somewhere in the depths, Forfar and Gunderson lost control. Lockwood lost consciousness below 400 feet and floated up to Exley who verified that he was okay and then made a heroic attempt to locate the two deeper divers. He descended well below 400 feet in his desperate attempt to save his friends but was unable to rescue them. They were not recovered.